Merjjena "Merj" B. Hemp, Ph.D.
One of my most favorite conversations in the CCP911 Project is with U.S. Army Veteran Joshua Monroe, who served 8 years in the U.S. Army Special Operations. Mr. Monroe's message for his fellow veterans and members of different communities in our country particuarly the young generations is moving and truly inspiring! Complicated conversations with Katie Jenkins (about politics, education, immigration, foreign affairs, pop culture, aviation, canning, etc.) Please download and share! Also available on iTunes and Google Play Music! My Podcast:Let's Talk It's Time America! Conversations about the most pressing issues affecting communities across America and the world. Episode 1 is about the 2016 Election with special guest, Pam Cartee, Montgomery County Clerk, Missouri. Please download and share! Also available on iTunes and Google Play Music! My name is Merjjena B. Hemp, but friends and family call me Merj. I have a passion for engaging and connecting with people from different cultures. My ongoing community engagement project, Complicated Conversations in the Post-9/11 Era, engaging different communities in hard conversations about our lives that have significantly changed after 9/11, as well as the most pressing issues the world is facing today. The videos of our conversations can be viewed on youtube.com/merjhemp. I am extremely grateful for the opportunity to go back to school and pursue a degree that enables me to communicate and engage people globally. I am greatly indebted to the Ronald E. McNair Post Baccalaureate Achievement Program, a federal program designed to prepare undergraduate first-generation and underrepresented students for doctoral studies through involvement in research and other scholarly activities. My conversation with Dr. Gregory Holliday, Ph.D., University of Missouri. A Veteran empowering veterans and other communities: A complicated conversation in the post-9/11 era. My conversation with Jonathan Butler a few weeks before declaring hunger strike at Mizzou (Concerned Student 1950), Let's talk it's time at Mizzou: Complicated conversations at the University of Missouri. My conversation with Yasmin Younis, Arab American Youth: A complicated conversation in the post-9/11 era. My conversation with Hanan, Somali Woman in America: A complicated conversation in the post-9/11 era. New playlist on my YouTube Channel, SKYDIVING. I skydive not just for fun but because I also believe that we should never stop exploring new things and learning new skills. Skydiving is an important tool that the CCP911 Project uses to engage people as well as bring communities together as what the Jump for the Vets (#jump4thevets) has been doing and continue to do in support of the mem and women who sacrificed so much for our country. My first accelerated freefall jump (AFF), an experience and a memory of a lifetime. I am an experienced public speaking instructor and coach/presenter for workshops, conferences, and meetings. My speaking engagements and workshops range from college students, non-profit organizations, military communities, to corporations. In Rebuilding the World: Let's Talk, Jason and I discuss different issues (e.g., terrorism, the veterans, guns rights, presidential candidates, etc.) unscripted and unrehearsed. We just speak our minds and we would like you to join us! Writing my memoir was not easy. It took every ounce of strength and courage to re-live my experiences as a thin, ugly, and unwanted runaway from a little village with no running water or electricity. 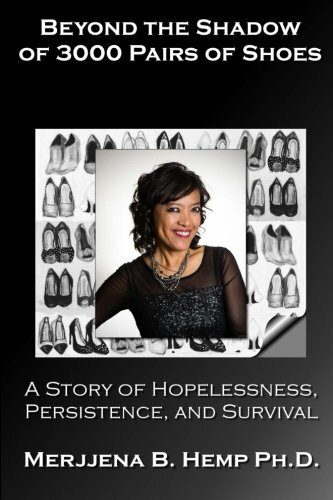 I shared my experiences living on the streets of Manila, marriage and military life in the U.S., as well as the path to a Ph.D. To be able to dig deep and let my writing flourish, I have to remind myself that my experiences are not as violent or brutal as those of many women and children in other parts of the world or military family members who live in pain and grief daily. I draw my strength, courage, enthusiasm, and commitment from them. I owe them immensely. I have three years teaching experience in a Communication Studies classroom, centering on various forms of communication such as Public Speaking, Organizational Communication, Persuasion, Interpersonal Communication, and Political Communication. As a graduate assistant in my Ph.D. program, the Department of Curriculum & Instruction at New Mexico State University, I taught as a substitute for Pedagogy of TESOL, Second Language Acquisition, and Language Literacy & Culture. My research interests include Multicultural Education, Pedagogy & Technology, Culture & National Security, and Global Engagement. My latest academic research is about engaging Arab Muslim women in complicated conversations about our lives in the post-9/11 era. Hemp, M.B. (2014). An exploration of Arab Muslim women's perspectives: A case study of experiences in higher education and communities in the post-9/11 era. Dissertation. Thank you so much! I truly appreciate your support for my effort to continue this amazing multifaceted project!